Even after all these years I still can't pick a favorite between this song and "Victim". Both are as powerful as ever. Love the "How sweet it is." at the end of this one. just like class of 78'said...this mix is candi's best!jimmy simpson's job on this one is fantastic!the victim' mix was hot but this one is tremendous!candi staton is by far the most unheralded queen of dance music! d.j.casbah ct. This jam is one of my Top 5 all-time favorites records. Her soulful-smooth-style vocals glide through this 12" with beefed up percussion compared to the album version. I just wish I could somehow add this remix on my ITunes. 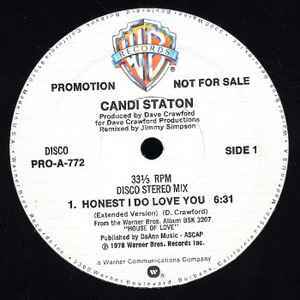 Most of Candi's 12" records are amazing, but this one is killer!! This one was undeservedly overlooked. If you aren't familiar, check out the 12" promo. 5 stars! !